How time flies! It's already mid May. As you know, I love to do handicrafts and make homemade gifts. You probably have seen my homemade bookmarks blog with Free Bookmark Templates. Around December of almost every year, I will make a simple homemade gift for my friends and it is a Homemade Calendar. 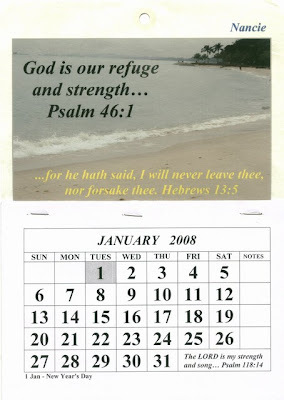 Subsequently, I began to make this Calender for some of my friends whenever possible. Over the last few years, I began to make the Calendar for more and more of my friends. It is good to know that some of my friends have found this Calendar useful. Thank God that for the last 8 years, I managed to make between 80 to 100 Calendars for my church friends, whenever I am well. Sometimes when I am too ill, I will not be able to make these Calendars. Otherwise, I will try my best to make them. I enjoy making them and I am thankful that they are useful to my friends. Although it's already May now, if you are interested, you can still make this simple Calendar for yourself or your friends. You can download the following files and make it too. You can personalised this simple Calendar by putting your name or your friend's name on the top right hand corner. You can also change the picture and the text according to your liking. 2. Open the file "Picture 1person.doc" and change the name on the top right hand corner to reflect your name, your friend's name, etc. Then print on color cards/papers. You can print 2 calendars on 1 paper. 3. Open the file "Dates Singapore.doc" or "Dates Others.doc" and print all the 3 pages. 4. Fold the pages into half. 5. Use a pen knife to cut and then fold the pages into half again. 6. Use the pen knife to cut again and arrange all the months accordingly. 7. Staple on top of the dates at a few places to keep them together. 8. Put double-sided scotch tape behind the dates and then stick it to the bottom of the Picture. 9. For hanging purposes, I usually punch a hole using a single-hole puncher and put a reinforcement ring on it. Do you like this Calendar? Do you have Hobbies? Or do you like to make gifts for your family and friends. Thank you for stopping by. Hope you have a blessed weekends! Hi Nancie! I've been reading your blog but it's a long time since i've left a comment! I love the calenders, i didn't know you had that artsy side in you. Good for you, and that's great you're able to make so many of them to distribute! Calendars are so fun to make and yours is glorious! Love and huggles! So good of you to share all this with us, Nancie. I'm sure there will be many of us who will be inspired to make their own calendars. When I was younger I did a lot of this kind of thing as well. I made plaques and cards and bookmarks, as well as inspirational booklets for seniors. Thank you for this Nancie, and may God bless you and strengthen you - as I'm sure He will. I am glad you love the calendar. I love art and crafts. They are very therapeutic to me. I feel very relaxed when I am doing it. And I feel very happy when my friends are happy to receive it. Thanks for stopping by. Take care. Hope you have a blessed weekends! Thanks for your encouragement. I love making calendars! Take care and have a blessed weekends! Thanks for your prayers, encouragements and supports. You are always very encouraging! May God bless and strengthen you too. I will be most happy to make for your friends. Later part of this year when I start designing the Calendar, I will email you a sample and some details. Take care and hope you have a blessed weekends! Nancie, I think this is a great idea. I love how you make it personal for each person with their name. I can just picture you, working away deeply involved in your craft. I'm so glad you have calendars and bookmarks as a creative outlet. They look great! Thanks for your encouragements. Hope you have a blessed week!